After you build a website for your business, one of the next biggest concerns is to improve your conversion rate. Your conversion rate is the percentage of people who visit your site who actually do what you want them to do there, whether it's purchasing a product, filling out a survey, posting a comment, or some other task. How do you improve this statistic? By using A/B testing! A/B (or split) testing is a simple technique where you run two slightly different versions of your website to see which one gets the most visitors and the best conversion rates. This type of testing is a great way to examine multiple factors within your site. Things like search ads, sales emails, and website copy can all be A/B tested. You can also test the difference made by seemingly minor changes, such as changing the color of a button from gray to blue. Just keep in mind that it’s called A/B testing because you’re testing two different versions. You can only tell which version is better if you change one factor at a time, instead of changing a bunch of things at once. Well-planned A/B testing can make a huge difference in your online sales efforts, and Virtual Market Advantage will go over the basics of setting up an A/B test below. The easiest way to track the changes in conversion rates when doing A/B testing is to use an analytics program. One of the most common analytics tools that web developers use is Google Analytics, which lets you easily track many aspects of your website. It gives you the ability to see the conversion rates directly. The very first thing you should do as you plan out your A/B test is to know exactly what factor you're going to test. Is it an on-site test or an off-site test? Deciding which factors you want to play around with will help you determine what exactly you need to test. If you intend to run an on-site test, you need to think of all the sales-related parts of your website, then narrow down which parts you're going to test. Make a list of the factors, both big and small, that could be affecting sales on your site. Consider what affects you when you visit other sites for purchases, whether positively or negatively, and ask the people around you what they prefer as well. With an off-site test, you will most likely be testing features like paid ads or a sales email. It’s important to test these types of advertising, because it will save you time and money in the long run. You don’t want to spend a lot of money on a paid advertisement that won’t convert. Rather, you should pay a little bit for several different ads, and push the ones that perform the best. A/B testing them will help you choose the right ads and sales emails to send out to your customers on a larger scale. Location of the call to action on the page. 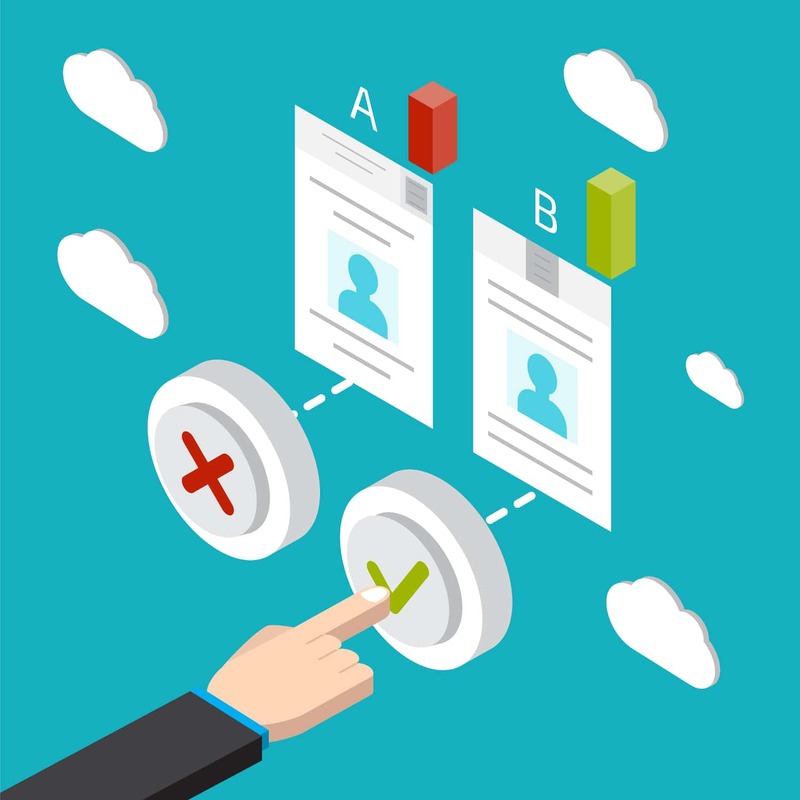 A/B testing is a process, and sometimes multiple tests need to be carried out before a final decision is made on what ad or sales email you're going to run. It’s a process that needs to be taken slowly. You want to make sure what you're testing is going to be worth it once you put it out there. Having accurate A/B testing is crucial for your bottom line and needs to be taken seriously. While you’re testing, you need to collect accurate data by using controlled tests. Doing this will help you determine which marketing strategies work best, not only for your company, but also for your product. Once you know which variation works best, you can use it time and time again. Don’t forget to continue testing, however. Even if one result improves your website by a lot, that doesn’t mean it’s the best possible option, or that it will remain the best option over time. Keep testing! When A/B testing is done consistently, you will see your bottom line improve. Knowing what works best and having the evidence of the results to back it up will make it easier for you to make marketing decisions and help you create higher quality marketing material in the future. If applicable, it will also let you show proven results to your boss! Make sure you test your marketing material regularly, as your audiences and what they prefer can change over time. You can also test factors that correlate with each other, like email A with landing page A, email A with landing page B, email B with landing page A, etc. In the end, the specific A/B testing you choose to do will be determined by your business and product, as well as your customer base. Running any split test is not something you want to rush. This is a process that needs to take time for you to really see the results. It may seem like a long and daunting task, but it will be well worth it over time, when you run a great ad or send out an improved sales email. Just keep in mind that if you do a quick one-time test, you will get a skewed result, and that it will not likely be good evidence for the majority of your customer base. Overall, taking your time and A/B testing the right components of your website will give you the best results and help your bottom line in the long run. Just like building your business to begin with, split testing takes some time and care. Performing these tests correctly will build your business, your product, and your customer base. If you want more information on how to set up your business online, check out VMA's other blogs, such as this one that goes into how to choose your niche!